It has been a long time since I’ve done a Guess the Food. I was wondering through Sprouts recently and spotted these guys and figured it might be fun if to see if people have actually looked at the ingredients in them. I think these things are very popular with young adult professionals (and probably others). I know before I started cooking regularly, my shopping lists would be lousy with these things. I would burn through a bunch during the week. The product itself checks a lot of supposedly healthy boxes. It uses mostly organic ingredients, non-GMO stuff, and has no preservatives or anything. That may or may not help you guess the food! I’ll try not to give away too much while working through this nutritional info. I can tell you that I would never eat just one of these even though that’s the serving size. This “food” has a pretty good amount of sodium in it for how small it is. There are products that are worse in the same line, but that’s the only thing that stood out to me as possibly an issue. Sure, there is some fat and stuff, but nothing too troubling to me. I would eat this any day of the week. The thing that can’t be described by the nutritional info is cost. Just one of these guys will set you back $2.50 which is pretty pricey considering what it is and that you can easily make it at home. This company really wants you to know that their ingredients are organic. I’m a fan of some organic stuff, but to be honest, a lot of stuff on their list isn’t a priority for me. Organic Wheat Gluten? Ok… I guess. The nicest thing about this ingredient list is I can work through all the ingredients without consulting with Wikipedia! I call that a win! Organic pinto beans – Normal old beans, except organic. These are the kind of beans that are typically used in refried beans. Organic whole wheat and wheat flour – I like that they use real flour in this product instead of enriched white flour. Filtered water – It’s water, but more expensive. Organic brown rice – A great ingredient. This is pretty much all good food in this sucker. Organic tomato puree – This is the easiest ingredient list ever. Expeller Pressed High Oleic Safflower and/or Sunflower Oil – This has a long name, but is actually the higher end of oils. It’s a colorless and flavorless oil. Organic onions and bell peppers – Good veg although pretty far down on the list. There is more oil than onions and bell peppers. Organic sweet rice flour – A different kind of flour made out of rice. Not exactly sure what they use this second flour for, but my guess is as a binder of some sort. Sea salt – Fancy salt. Spices – Who knows… I would guess some cumin and paprika at a minimum. 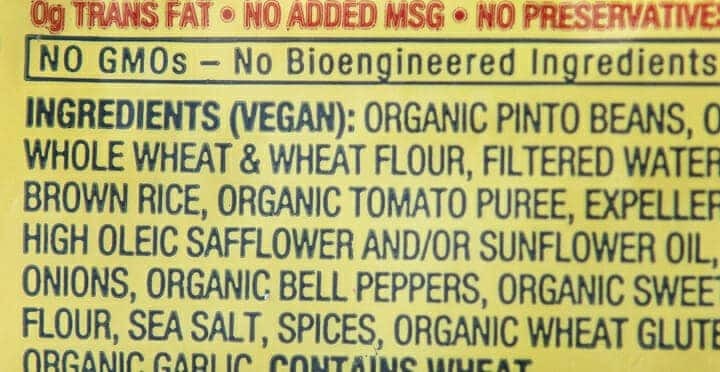 Organic Wheat Gluten – Just straight up gluten which I’m sure they use as a thickener and binder. Organic garlic – I can tell you that I use more garlic than they do when I make these! Overall, a pretty great list of ingredients. Maybe that’ll help you and maybe it won’t. Can you Guess The Food? Leave a comment! Can you Guess the Food? Amy’s burritos? Or some other frozen burrito? I will say on the nights that I don’t feel like cooking 1 of those will fill me up though! I agree; it’s gotta be a frozen burrito. I still eat these a few times a year, when I literally do not even have 5 minutes to make something better, but they are always a bit disappointing. Yep, this is Amy’s organic burrito, in the green (and white) wrapper. That’s the one for sure! I am voting for organic bean burritos as well. Definitely a frozen burrito! Have you done a homemade trial with frozen burritos? We make and freeze them in batches of 10 or 12 (or however many tortillas are in the package, ha) and the cost difference isn’t really that much, but we do get to put whatever we want inside, which is nice. You should really be able to make these for well under $1 each. Unless you’re just stacking it full of organic meat and not putting the bean filler in. Based on the ingredients, these burritos are pretty much just pinto beans and the wrapper, with some other stuff thrown in as an afterthought. I can try making these in a batch, but I think I’d aim for near $.50 each — if making them identically, of course. This basically screams rice and bean burrito. 52g carbs, ouch! Not sure how “healthy” these can be and organic wheat gluten? glad I never buy these – but I do buy other Amy’s products – gotto check those labels again.